Spade plans to avoid politics and focus solely on pop-culture on his 11:30 p.m. late-night talk show, premiering after The Daily Show with Trevor Noah later this year. Each night, the SNL alum and a rotating group of comedians and celebrities will break down the day's pop-culture news. The untitled show will also feature field pieces inspired by Spade's Instagram Stories, where he each day he mocks people around L.A. while he's walking around and driving. 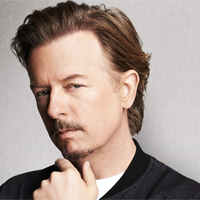 The new show marks a return to Comedy Central for Spade, who hosted The Showbiz Show that parodied shows like Access Hollywood and Entertainment Tonight from 2005 to 2007. Comedy Central has struggled with the post-Daily Show slot since Stephen Colbert's The Colbert Report ended in 2014. The Nightly Show With Larry Wilmore lasted 19 months, while The Opposition With Jordan Klepper aired for 10 months. David Spade posts a tribute to late sister-in-law Kate Spade: "She could make me laugh so hard"